Click the video tab to see how easy the keychains snap together. The die cutter shown in the video is NOT mandatory. You can cut your photos using a scissors. #972 has been discontinued in bulk packing, it is only available in polybags. How long does it take to ship to Alberta Canada? Shipping to Alberta takes approximately 4 business days from our warehouse in Vernon Hills, IL. 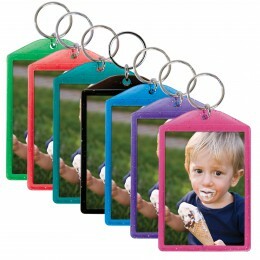 Hi, I'm buying a case of the 1-3/8 x 1-3/4 plastic snap in picture keychain, is 144 the number of keychains, or is it 72 keychains with a total of 144 pieces(one for the pictures and one for the cover? 144 is the total number of photo keychains you will receive. I'm interested with the 2 smallest sizes. The size listed refers to the photo/insert size. So 1-3/8" x 1-3/4" holds a 1-3/8" x 1-3/4" size photo and the overall size is 1-3/4" x 2-5/8". 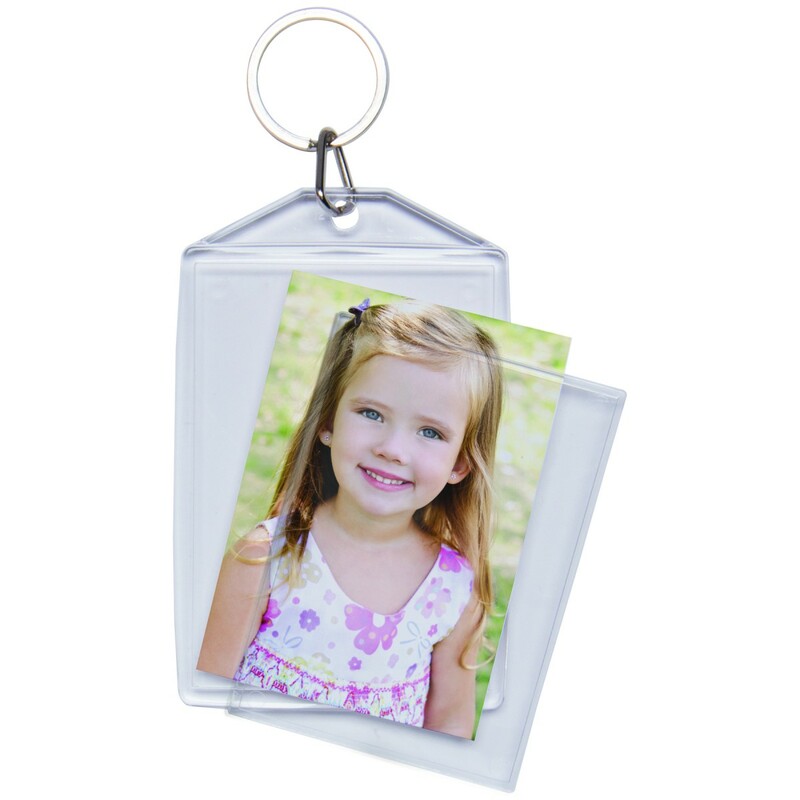 The 2" x 2-7/8" holds a 2" x 2-7/8" photo and the overall size is 2-3/8" x 3-5/8". Which sizes are MADE IN USA? The key chains that are packaged poly-bagged are made over seas. The items that do not say poly-bagged are made in the USA. 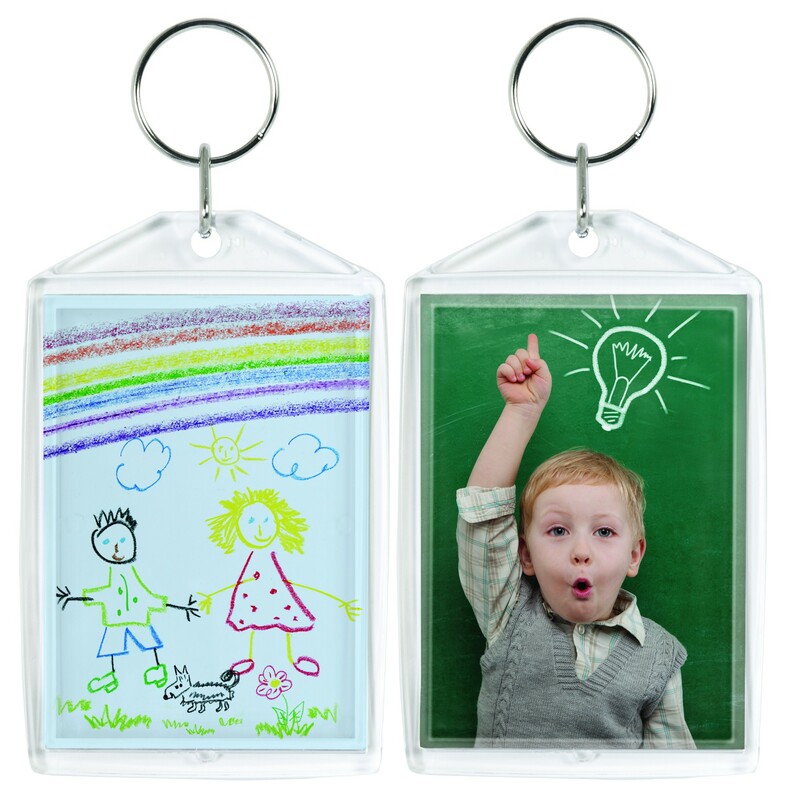 Do you have print templates available for the sizes of the keychain inserts? Previously I have used Avery business card template, but none of these openings are consistent with any of my label templates. I use the Booth 2x6 and 4x6 prints. What size would I need to hold these photos? 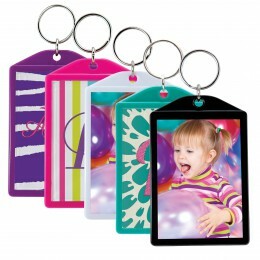 Unfortunately, we do not sell photo keychains that hold a 2x6 or 4x6 photo as they would be too big. However, we do sell handheld punches you could use to cut your photo down to one of the photo keychain sizes we do have.